O, HOW I LONG TO SEE. 2 O, how I long to see your day of glory dawning, when you will wash away ev’ry tear. 3 O, how long, how long will it take ‘til the lion lie down with the lamb? ‘Til we turn our swords into plowshares, and peace like a river flows over the land? 4 O, how I long to see your day of glory dawning, when you will wash away ev’ry tear. 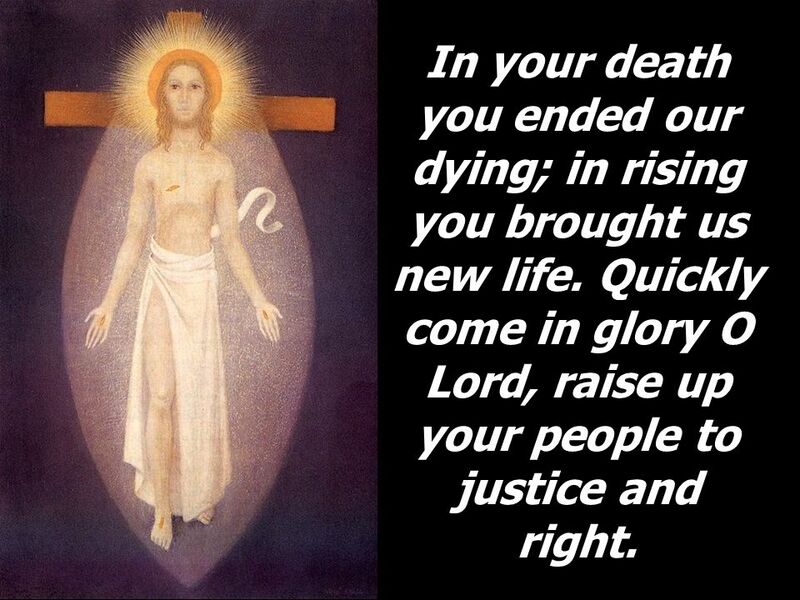 In your death you ended our dying; in rising you brought us new life. 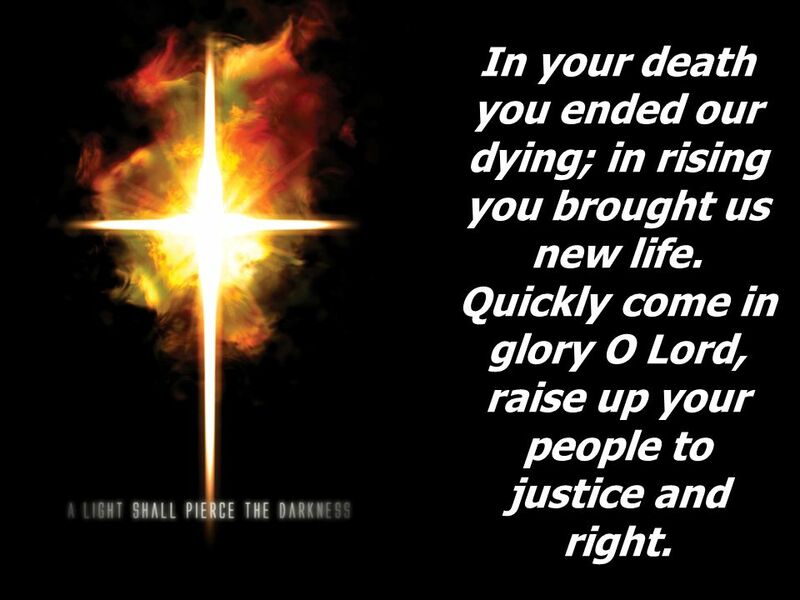 Quickly come in glory O Lord, raise up your people to justice and right. 6 O, how I long to see your day of glory dawning, when you will wash away ev’ry tear. 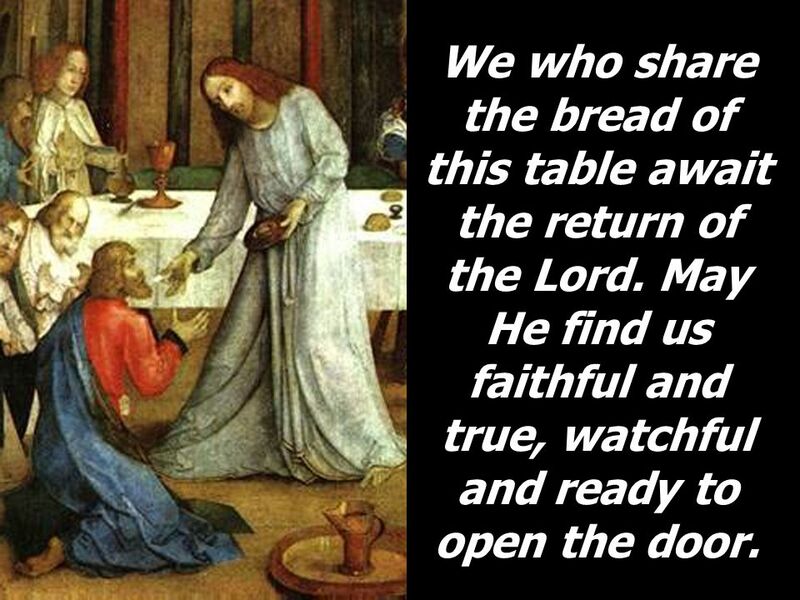 We who share the bread of this table await the return of the Lord. 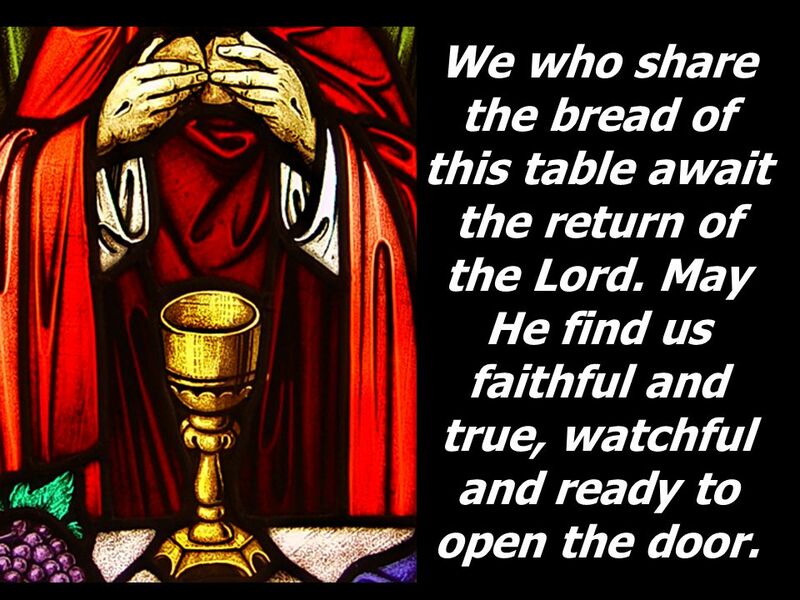 May He find us faithful and true, watchful and ready to open the door. 8 O, how I long to see your day of glory dawning, when you will wash away ev’ry tear. 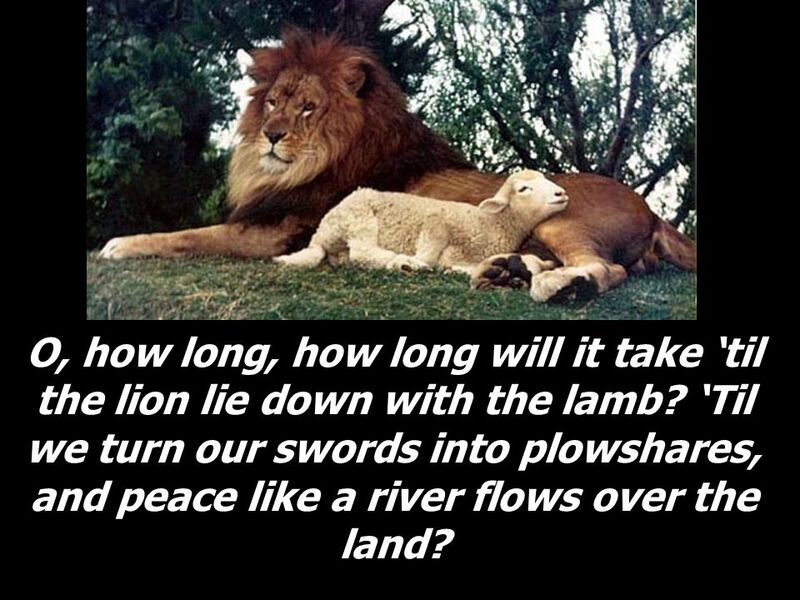 9 O, how long, how long will it take ‘til the lion lie down with the lamb? ‘Til we turn our swords into plowshares, and peace like a river flows over the land? 10 O, how I long to see your day of glory dawning, when you will wash away ev’ry tear. 12 O, how I long to see your day of glory dawning, when you will wash away ev’ry tear. 14 O, how I long to see your day of glory dawning, when you will wash away ev’ry tear. 15 O, how long, how long will it take ‘til the lion lie down with the lamb? ‘Til we turn our swords into plowshares, and peace like a river flows over the land? 16 O, how I long to see your day of glory dawning, when you will wash away ev’ry tear. 18 O, how I long to see your day of glory dawning, when you will wash away ev’ry tear. 20 O, how I long to see your day of glory dawning, when you will wash away ev’ry tear. 21 O, how long, how long will it take ‘til the lion lie down with the lamb? ‘Til we turn our swords into plowshares, and peace like a river flows over the land? 22 O, how I long to see your day of glory dawning, when you will wash away ev’ry tear. 24 O, how I long to see your day of glory dawning, when you will wash away ev’ry tear. 26 O, how I long to see your day of glory dawning, when you will wash away ev’ry tear. 27 O, how long, how long will it take ‘til the lion lie down with the lamb? ‘Til we turn our swords into plowshares, and peace like a river flows over the land? 28 O, how I long to see your day of glory dawning, when you will wash away ev’ry tear. 30 O, how I long to see your day of glory dawning, when you will wash away ev’ry tear. 32 O, how I long to see your day of glory dawning, when you will wash away ev’ry tear. 33 O, how long, how long will it take ‘til the lion lie down with the lamb? ‘Til we turn our swords into plowshares, and peace like a river flows over the land? 34 O, how I long to see your day of glory dawning, when you will wash away ev’ry tear. 36 O, how I long to see your day of glory dawning, when you will wash away ev’ry tear. 38 O, how I long to see your day of glory dawning, when you will wash away ev’ry tear. 39 O, how long, how long will it take ‘til the lion lie down with the lamb? ‘Til we turn our swords into plowshares, and peace like a river flows over the land? 40 O, how I long to see your day of glory dawning, when you will wash away ev’ry tear. 42 O, how I long to see your day of glory dawning, when you will wash away ev’ry tear. 44 O, how I long to see your day of glory dawning, when you will wash away ev’ry tear. 45 O, how long, how long will it take ‘til the lion lie down with the lamb? ‘Til we turn our swords into plowshares, and peace like a river flows over the land? 46 O, how I long to see your day of glory dawning, when you will wash away ev’ry tear. 48 O, how I long to see your day of glory dawning, when you will wash away ev’ry tear. 50 O, how I long to see your day of glory dawning, when you will wash away ev’ry tear. 51 O, how long, how long will it take ‘til the lion lie down with the lamb? ‘Til we turn our swords into plowshares, and peace like a river flows over the land? 52 O, how I long to see your day of glory dawning, when you will wash away ev’ry tear. 54 O, how I long to see your day of glory dawning, when you will wash away ev’ry tear. 56 O, how I long to see your day of glory dawning, when you will wash away ev’ry tear. 57 O, how long, how long will it take ‘til the lion lie down with the lamb? ‘Til we turn our swords into plowshares, and peace like a river flows over the land? 58 O, how I long to see your day of glory dawning, when you will wash away ev’ry tear. 60 O, how I long to see your day of glory dawning, when you will wash away ev’ry tear. 62 O, how I long to see your day of glory dawning, when you will wash away ev’ry tear. 63 O, how long, how long will it take ‘til the lion lie down with the lamb? 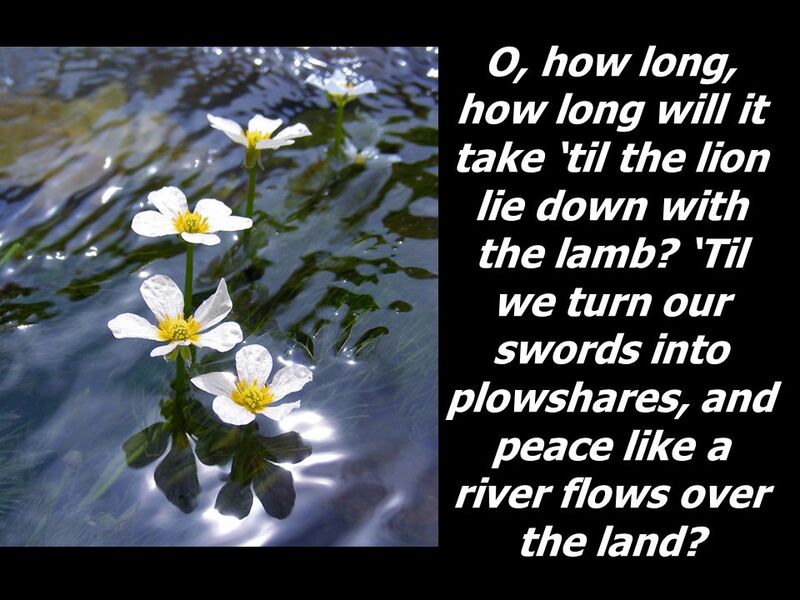 ‘Til we turn our swords into plowshares, and peace like a river flows over the land? 64 O, how I long to see your day of glory dawning, when you will wash away ev’ry tear. 66 O, how I long to see your day of glory dawning, when you will wash away ev’ry tear. 68 O, how I long to see your day of glory dawning, when you will wash away ev’ry tear. 69 O, how long, how long will it take ‘til the lion lie down with the lamb? 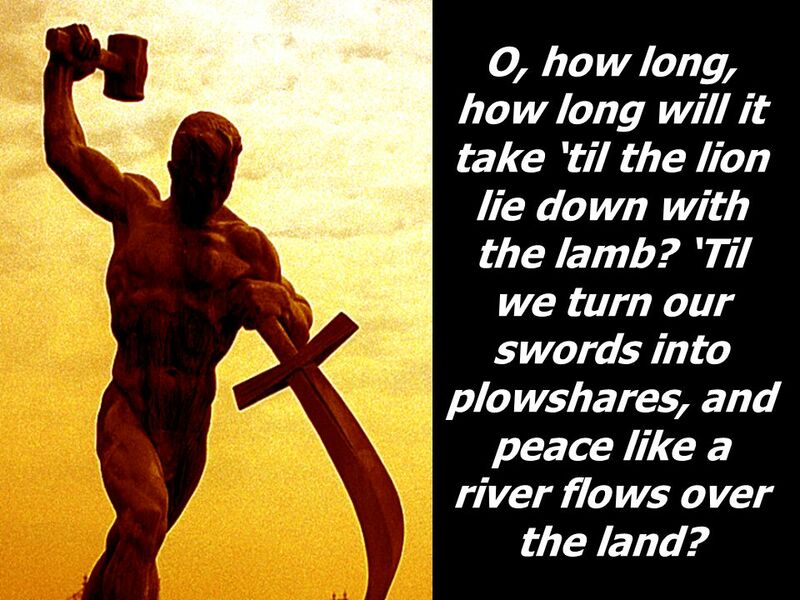 ‘Til we turn our swords into plowshares, and peace like a river flows over the land? 70 O, how I long to see your day of glory dawning, when you will wash away ev’ry tear. 72 O, how I long to see your day of glory dawning, when you will wash away ev’ry tear. 74 O, how I long to see your day of glory dawning, when you will wash away ev’ry tear. 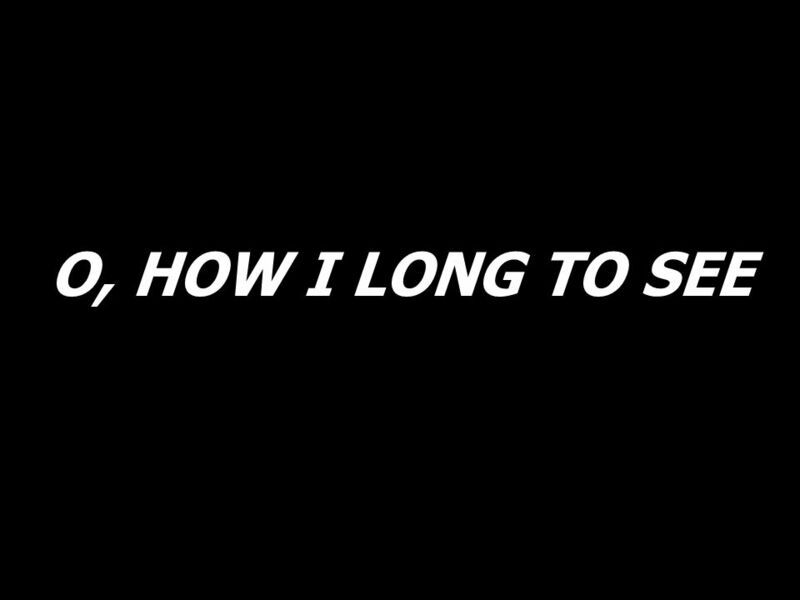 Download ppt "O, HOW I LONG TO SEE." Blessed be your name in the land that is plentiful, where your streams of abundance flow, blessed be your name. SING TO THE KING (O WORSHIP THE KING) O worship the King, All glorious above And gratefully sing, His wonderful love. Being Ready for the Wedding 1 The kingdom of heaven is like what happened one night when ten girls took their oil lamps and went to a wedding to meet the. Because of You There’s a place Where the streets shine With the glory of the Lamb There’s a way, we can go there We can live there beyond time. Sing To The King Sing to the King Who is coming to reign. 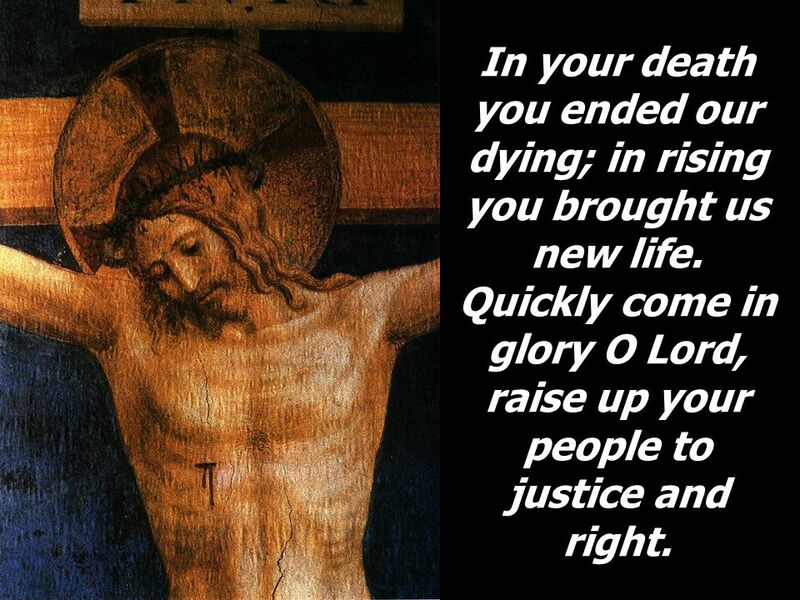 Glory to Jesus The Lamb that was slain. Psalm 37 Don’t fret! –Wickedness will end –So turn from it For the man of peace –Trust in, delight in, hope in, take refuge in, wait for & commit to Jesus. WORSHIP, EXALT (MAJESTY) Majesty, worship His majesty Unto Jesus be all glory, honor and praise. 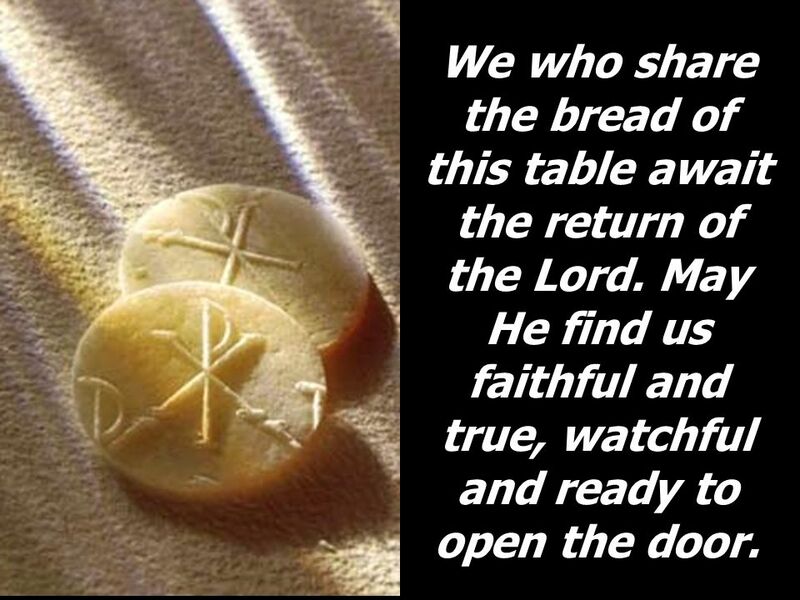 RICHEST BLESSINGS OF THE RISEN LORD Dont you know that I came to this world to carry all your problems on myself in order that in Me you will find answer. 10,000 Reasons Bless the lord oh my soul, oh my soul Worship Your holy name Sing like never before, Oh my soul I worship Your holy name. There Is A Fountain There is fountain filled with blood drawn from Emmanuel’s veins And sinners plunged beneath that flood lose all their guilty stains. 1 st Friday Mass March 2, 2012 Gathering Song Christ Be Our Light. Who is like Him The Lion and the Lamb Seated on the throne Mountains bow down Every ocean roars To the Lord of hosts. All I wanna do is praise Your name From the rising of the sun ‘til the going down of the same You are my God and all I wanna do is praise Your name I praise. Lion of Judah. You’re the Lion of Judah the lamb Who was slain You ascended to Heaven and Evermore will reign At the end of the age when the earth You.